The Old Parlour in Maxworthy, near Crackington Haven, Cornwall sleeps 8 people. 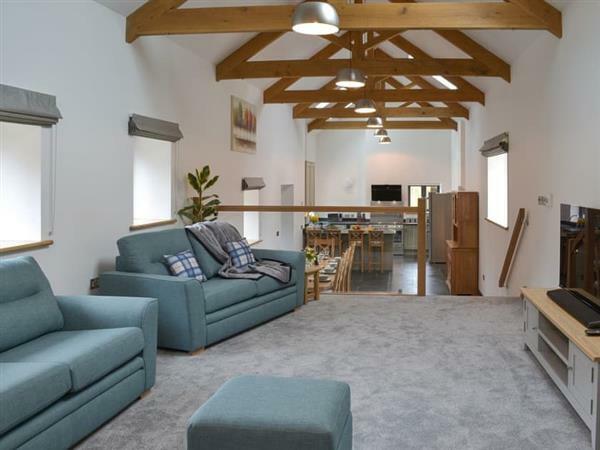 The Old Parlour near Crackington Haven is a superb luxury barn conversion located on a working farm, in a quiet rural location just 20 minutes’ drive from Crackington Haven, and the fabulous North Cornwall coastline. This detached traditional stone building, adjacent to the owners’ home, has all the mod cons of modern life making this property a truly luxurious experience. There is a hot tub located undercover to the side of the property, as well as an undercover games area with table tennis. Whatever the weather you are sure to have something you can enjoy. All the little extras that make a holiday special have been thought of at The Old Parlour, such as big fluffy bath towels and separate outdoor hot tub towels, outdoor doggy shower/wash area for your pampered pooch, enclosed courtyard with outdoor furniture, Wi-Fi, televisions in all bedrooms complete with Netflix, underfloor heating and much more. The large modern kitchen is complete with real slate worktops, central island station, American style fridge/freezer and large range style cooker, making sure that cooking for the family is a pleasure. The dining table comfortably seats 10 to 12 people. Overlooking the dining area, the living room has high vaulted ceilings, exposed oak beams and a roaring wood burner. There is also a second living room on the ground floor, again really spacious with another large TV, big comfortable corner sofas and slate floor. The master bedroom suite on the ground floor is huge with doors opening onto the courtyard, and a large en-suite bathroom with bath and shower cubicle. There is even a sofa in the bedroom which can be used for flexible sleeping arrangements. All the bedrooms have excellent quality mattresses and lovely linen, modern oak furniture and comfortable furnishings. All in all a really lovely property perfect for your luxury family holiday or special occasion. The beach is 8 miles from The Old Parlour near Crackington Haven. With the shop, pub and restaurant 5 miles from The Old Parlour. Living room 1: With wood burner, 49 Smart TV with Netflix, and beams. Living room 2: With 49 Smart TV with Netflix. Kitchen: With electric range, microwave, American style fridge/freezer, dishwasher and slate floor. Bedroom 1: With king-size bed, double sofa bed (for flexible sleeping arrangements), 40 Smart TV with Netflix, doors leading to courtyard and en-suite with bath, shower cubicle and toilet. Bedroom 2: With double bed, 32 Smart TV with Netflix and en-suite with shower cubicle and toilet. Bedroom 3: With king-size bed and 32 Smart TV with Netflix. Bedroom 4: With double bed and 32 Smart TV with Netflix. Oil central heating (underfloor on ground floor), electricity, bed linen, towels and Wi-Fi included. Initial logs for wood burner included. Travel cot and highchair available on request. Welcome pack and doggy extras. Enclosed courtyard with patio, garden furniture and barbecue. Table tennis. Hot tub for 6 (private). 2 dogs welcome, to be kept on a lead at all times (working farm). Private parking for 4 cars. No smoking. Holidays at The Old Parlour run from Friday to Friday. Pets allowed at The Old Parlour. For a better idea of where The Old Parlour is, you can see The Old Parlour on the map below. You can find more large holiday cottages (that's cottages which sleep 8 or more people) in Cornwall. If you want to see more large cottages, have a look at large cottages in Cornwall. The Old Parlour is in Cornwall; should you be on the lookout for a special offer, you can find all the special offers in Cornwall. It's always worth checking to see what is on offer at the moment. Do you want to holiday near The Old Parlour (UK10681), you can see other cottages within 25 miles of The Old Parlour; have a look to find your perfect holiday location.